Display the regular keyboard on screen. Press and hold the Settings or Options button on the keyboard (left of the spacebar). Here, you can see the standard selection. You can’t shrink a keyboard with a pinch of your fingers, but you can make it float, which gives you a smaller, movable version. Press and hold the Settings (gear) icon on the keyboard (left of the spacebar). Tap the icon that shows a stack of keyboards. That icon is ordinarily all the way to the right. When the floating keyboard is onscreen, you can move it by pressing and holding the little tab at its top. 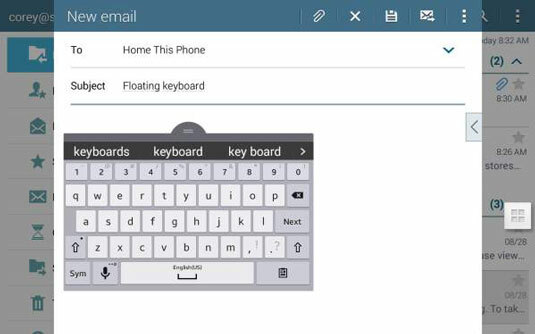 To return to the regular keyboard, press and hold the Settings icon on the floating keyboard, tap the icon with the tiny stack of keyboards, and tap QWERTY. Now for something completely beyond the ability of the typical computer keyboard — your tablet’s operating system can read words that you write. Use your finger; never use a pen or stylus! Tap the icon that shows the letter T beside a tiny little pen. 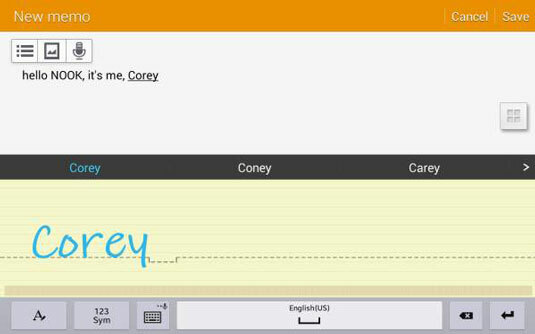 The keyboard is replaced by an electronic version of a yellow legal pad. Touch your finger to the pad and start drawing characters. You can either print individual characters, or use your best (or worst) form of cursive. If you use individual characters, you’re going to need to practice a bit to avoid pausing too long between letters; a pause is considered to be the end of the word. 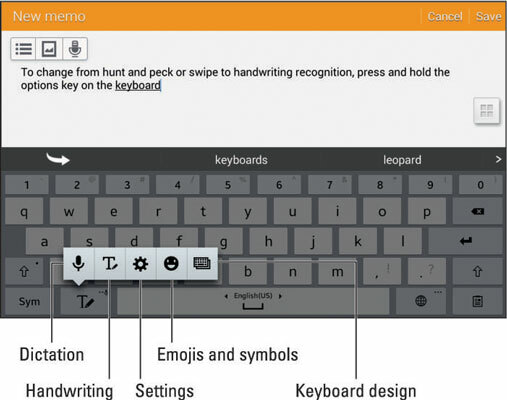 If your chicken scratch gets misread, tap a suggested word in the panel, or tap the backspace key. The dashed line differentiates between uppercase and lowercase letters, or to enter punctuation. To spell my name, I could either make a significant difference in size between the C and the rest of the characters, or place the C above the line and the orey below it. A short hooked mark above the line is interpreted as a single or double quote. That same hook placed below the line is read as a comma. 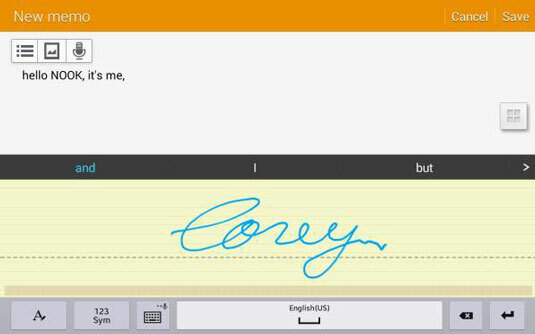 Once the device has interpreted your handwriting, it displays a cleaned-up version with much better penmanship.